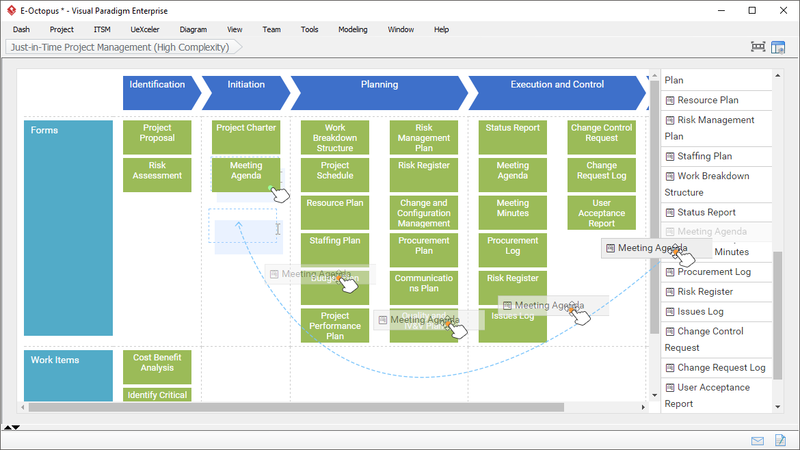 Manage and perform project management in a tailored 2D process map. The out-of-the-box project management tool provides you with the necessary process template with work items that guide you through an agile, incremental project management deliverables development process. All work items come with step-by-step guide-through instructions and samples. Your team can flexibly work together to get the work done in either sequence or parallel way; follow through or skip over some of the activities. 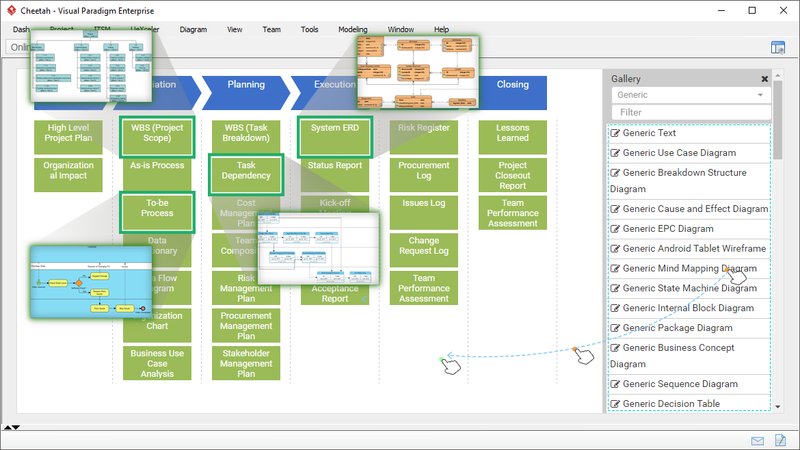 No matter you adopt the out-of-the-box project management process template straight away, or you intend to customize, touch-up, add or remove some process steps of the template to fit your specific needs, Just-in-Time Process Map empowers you the freedom of choices with simple drag & drop GUI. 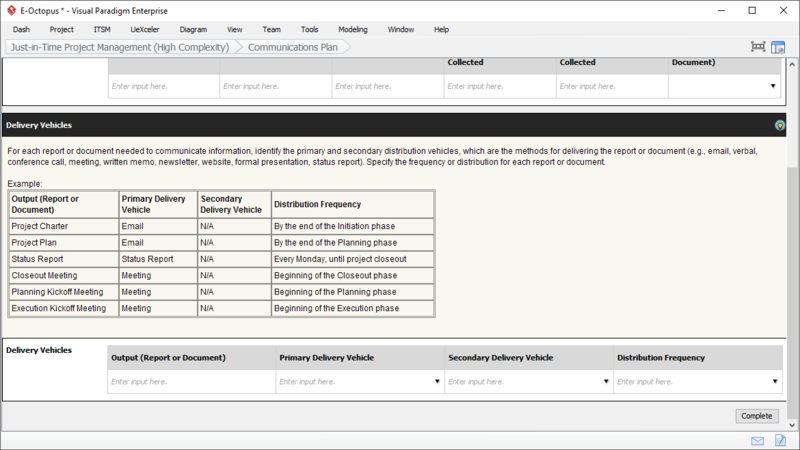 Collection of process data is achieved by using work items that support form-filling, like the figure shown below. 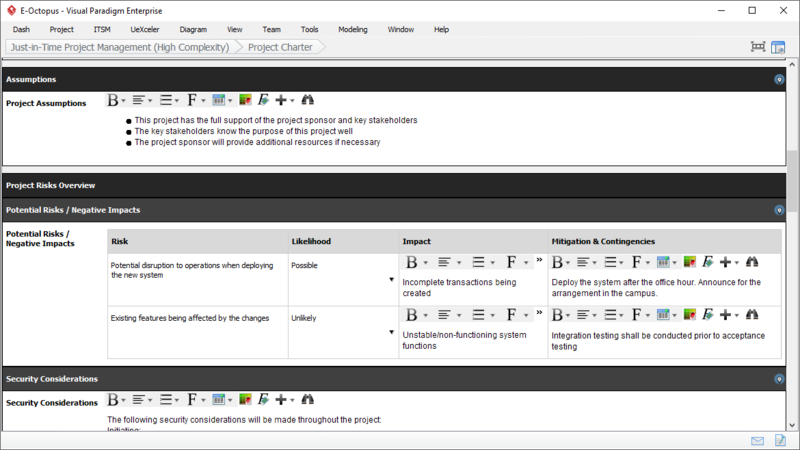 Typical examples of form-filling work items include project charter, issue log and lessons learned report. All the work items are well-designed and ready-to-use. 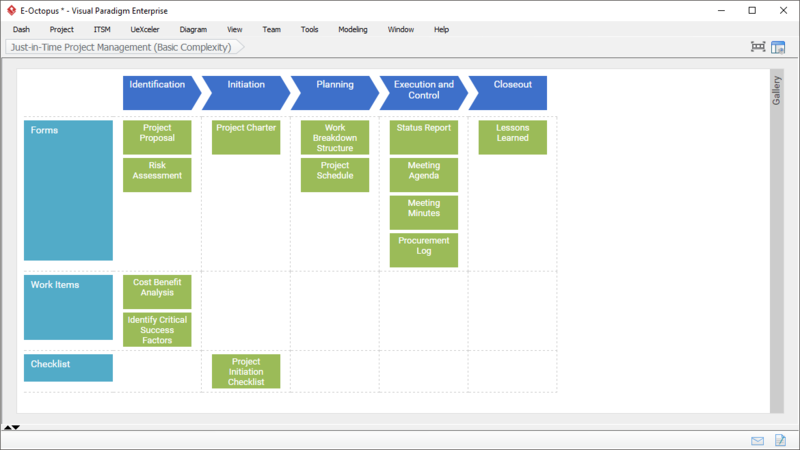 You can include them in your process map without further customization needed. Configure your Just-in-Time process by adopting the pre-defined forms and work items bundled with the project management tool straight-away. 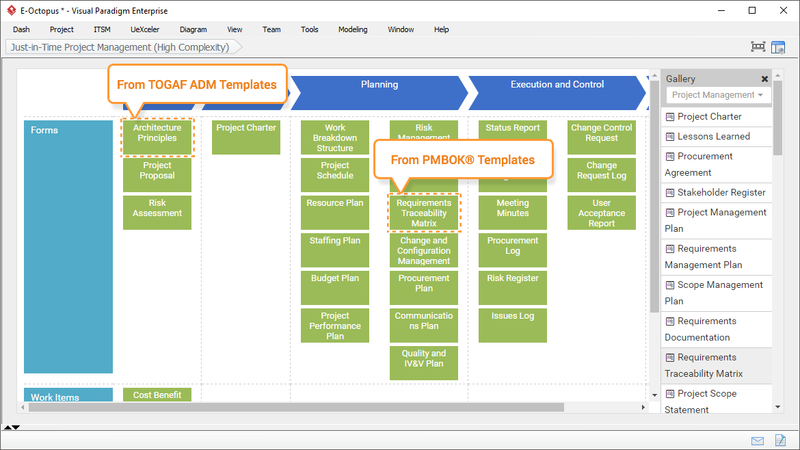 By using the pre-defined forms or work items you can select, mix and match different reusable work items in your process, which covers TOGAF ADM activities, PMBOK and other general project management activities. 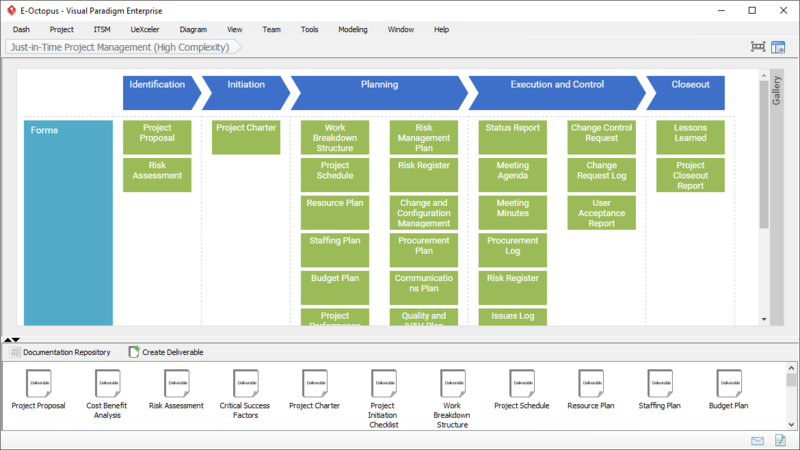 There is no one-size-fit-all solution when it comes to project management. 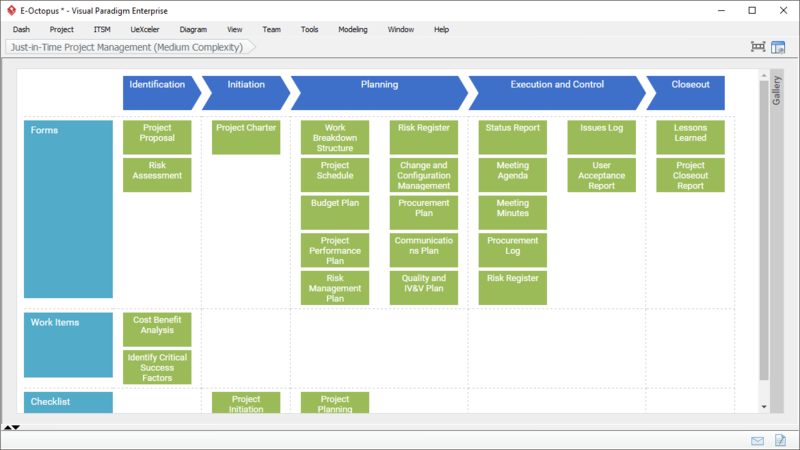 The Just-in-Time project management tool comes with four sets of project management schemes that cater different levels of project complexities, allowing your team to perform and complete only adequate amount of management activities and deliverables. 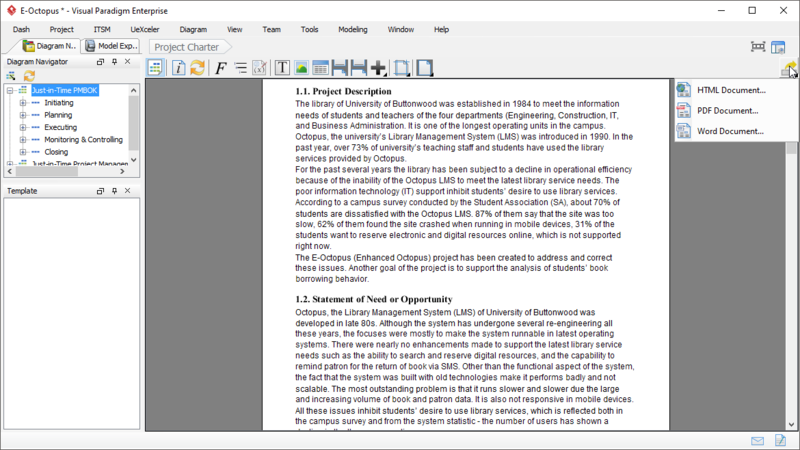 The information provided under work items will be consolidated and summarized in nice formatted, and yet customizable project management deliverables. 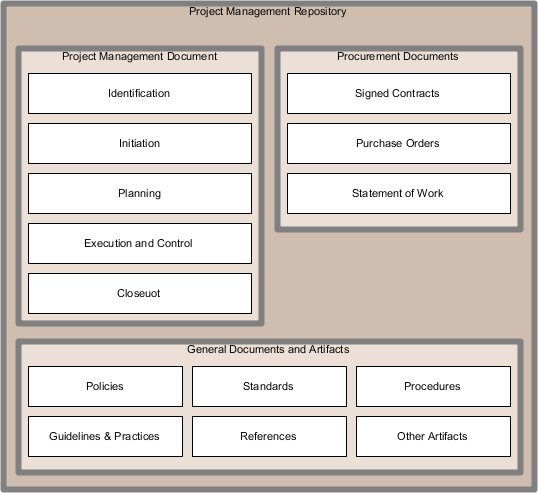 You can easily access the auto-generated copies under the Project Management Repository, a visual File Cabinet, or to generate one on-demand. 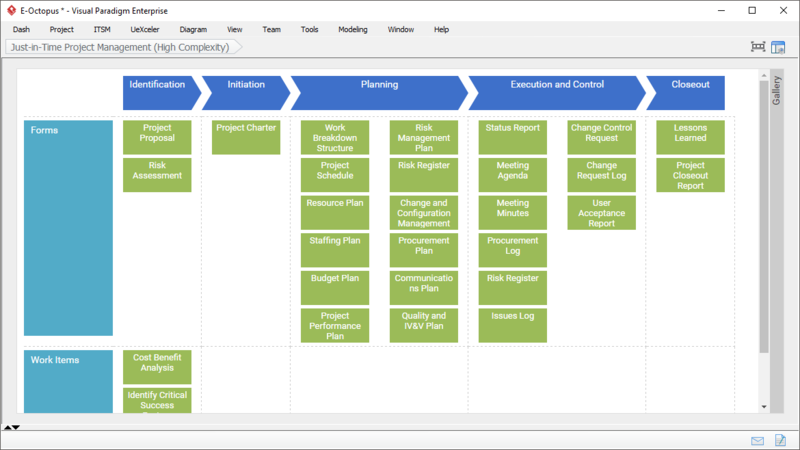 As your team complete work items on the process map, the information entered will be consolidated and summarized as project management deliverables, which are automatically generated and archived in the project management repository, a visual File Cabinet. You can easily find hundreds of references in the topic of Project Management, but that will cost you hours of effort for searching the relevant information to move a step forward! Visual Paradigm provides you with inline, step-by-step guide-through instructions together with samples for each step. 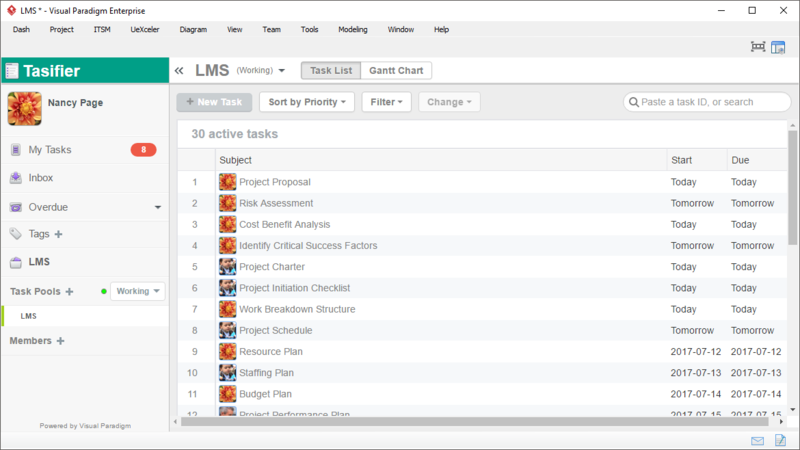 Assign task for each of the work items in the Just-in-Time process map to Tasifier, the task management platform anytime and work collaboratively with your team members.